Do you feel uncomfortable using the toilet/lavatory in unfamiliar surroundings? For many people suffering from Shy Bladder visiting different places can feel like an unbearable chore as, even with a full bladder they may find it difficult to urinate. If you have experienced this problem then it's probable that something in your past happened to cause it. 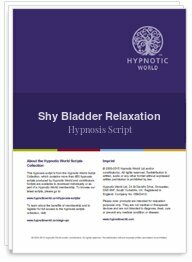 That memory might even be buried deep in your subconscious mind - however this hypnosis download script can help you to uncover whatever is causing your Shy Bladder and lay the ghost to rest, once and for all.